How NOT to Install a Baby Gate! Unfortunately as professional babyproofers, we see installations like this more often than we should. Improperly installed baby gates not only provide a false sense of security but can also pose a safety hazard. 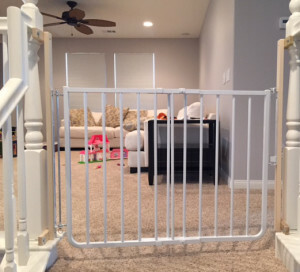 This is why it is so important to hire a professional that knows the correct gate to install for your specific needs but also knows how to install the baby gate correctly. 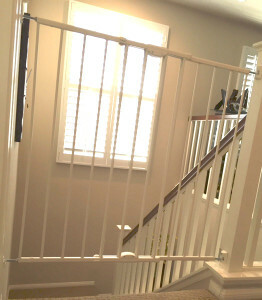 The baby gate installed at the top of a stairway below was installed by the family handyman. As you can see, the gate is installed too far from the floor providing a baby the ability to crawl under the gate and access to the staircase. As the baby gets older and becomes a toddler, the gap under the gate becomes an entrapment/strangulation hazard. 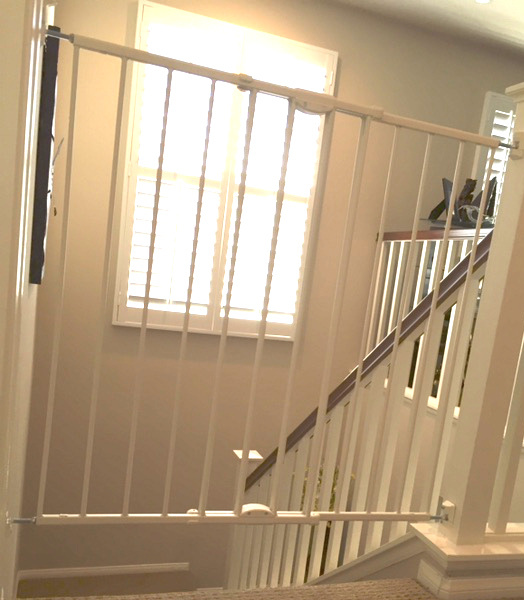 Because of the ledge at the bottom of the banister posts, the correct baby safety gate needs to be installed so that it will mount properly to the banister post but also be close enough to the floor (less than 3″) so as not to pose a falling or entrapment hazard. The gate to the left is properly mounted to the banister posts with a NO HOLES Banister Kit eliminating any damage to the customers banister post. The gate is also mounted less than 3″ from the floor to avoid an entrapment hazard. If you need help installing a baby safety gate on your stairs, please contact your local Baby Safe Homes safety professional. We would be happy to assist you with your childproofing needs.